Qualms of An Antagonist: Fluffy Rabbit. 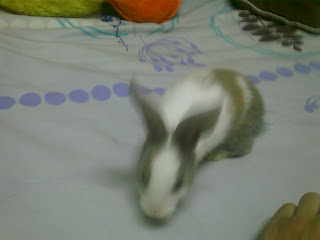 "May Lynn : Jr, Can I tumpang a bunny at ur place for few days pls?" Looked at the message for quite a while first. "Well why not?What's the worst that can happen?" I thought. Murphy's Law was in effect again. She's 2 months old and is a very curious bugger. 3)Case in point,once I got too tired to wake up and feed her in the morning so I figured she wouldn't mind being fed an hour later or so but I was wrong, she ends up kicking the empty bowl against the cage every 5 minutes and I end up waking up to feed her. 4)She does not like the top of the carrot so what she does is she tosses it out of the cage to a single same spot every time. So after a week May Lynn came and took her back. And finally I got my peace back. 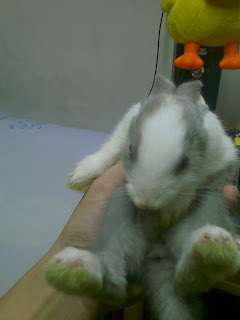 Feed her with quality pellets and handful of hay a day is enough.. i have 9 bunnies and dont feel difficult at all..